Gratitude is one of the highest forms of expression of love to others and the Universe; only when we are grateful for what we have, for all the blessings that come in our daily life, for all the lessons life bestows upon us then we will be filled with the abundance from the Universe. A reminder to myself to always count my blessings with deep gratitude and love. 1. Let us be grateful to the people who make us happy; they are the charming gardeners who make our souls blossom. 2. When you have a good friend that really cares for you and tries to stick in there with you, you treat them like nothing. Learn to be a good friend because one day you’re gonna look up and say I lost a good friend. Learn how to be respectful to your friends, don’t just start arguments with them and don’t tell them the reason, always remember your friends will be there quicker than your family. Learn to remember you got great friends, don’t forget that and they will always care for you no matter what. Always remember to smile and look up at what you got in life. 3. Cultivate the habit of being grateful for every good thing that comes to you, and to give thanks continuously. And because all things have contributed to your advancement, you should include all things in your gratitude. 4. Do not spoil what you have by desiring what you have not; remember that what you now have was once among the things you only hoped for. 5. Acknowledging the good that you already have in your life is the foundation for all abundance. 6. If the only prayer you said was thank you, that would be enough. 7. We must find time to stop and thank the people who make a difference in our lives. 8. You pray in your distress and in your need; would that you might pray also in the fullness of your joy and in your days of abundance. 9. We can only be said to be alive in those moments when our hearts are conscious of our treasures. 10. When you arise in the morning, think of what a precious privilege it is to be alive- to breathe, to think, to enjoy, to love-then make that day count! The problem that we have with a victim mentality is that we forget to see the blessings of the day. Because of this, our spirit is poisoned instead of nourished. 11. God gave you a gift of 86 400 seconds today. Have you used one to say thank you. 12. In normal life we hardly realize how much more we receive than we give, and life cannot be rich without such gratitude. It is so easy to overestimate the importance of our own achievements compared with what we owe to the help of others. 13. We only live once. We all have an expiration date after that we will never come again. I am not saying that to make you sad. I am saying that so you can cherish each moment in your life and be grateful that you are here and you are Special. There are two days in the year that you cannot do anything: YESTERDAY & TOMORROW: Only TODAY you can Be Happy, Smile, Dream, Love, Feel, & Be Thankful. 14. May your days be filled with Abundance, Joy and Gratitude to God, for all the gifts you have received and have yet to receive! 15. Being in the habit of saying “Thank you,” of making sure that people receive attention so they know you value them, of not presuming that people will always be there–this is a good habit, regardless…make sure to give virtual and actual high-fives to those who rock and rock hard. 16. Gratitude always comes into play; research shows that people are happier if they are grateful for the positive things in their lives, rather than worrying about what might be missing. 17. When you express gratitude for the blessings that come into your life, it not only encourages the universe to send you more, it also sees to it that those blessings remain. 18. Gratitude and love are always multiplied when you give freely. It is an infinite source of contentment and prosperous energy. 19. If we want to keep the blessings of life coming to us, we must learn to be grateful for whatever is given. 20. If we never experience the chill of a dark winter, it is very unlikely that we will ever cherish the warmth of a bright summer’s day. Nothing stimulates our appetite for the simple joys of life more than the starvation caused by sadness or desperation. In order to complete our amazing life journey successfully, it is vital that we turn each and every dark tear into a pearl of wisdom, and find the blessing in every curse. 22. I have learned over a period of time to be almost unconsciously grateful–as a child is – for a sunny day, blue water, flowers in a vase, a tree turning red. I have learned to be glad at dawn and when the sky is dark. Only children and a few spiritually evolved people are born to feel gratitude as naturally as they breathe, without even thinking. Most of us come to it step by painful step, to discover that gratitude is a form of acceptance. 23. Whatever you appreciate and give thanks for will increase in your life. 24. With all its sham, drudgery and broken dreams, it is still a beautiful world. Be cheerful. Strive to be happy. 25. For me, every hour is grace. And I feel gratitude in my heart each time I meet someone and look at his or her smile. 26. All we have is all we need. All we need is the awareness of how blessed we really are. 27. The more we give away, the more is given to us. 28. When you lose something in your life, stop thinking it’s a loss for you … it is a gift you have been given so you can get on the right path to where you are meant to go, not to where you think you should have gone. 30. Life is no ‘brief candle’ to me. It is a sort of splendid torch which I have got hold of for the moment, and I want to make it burn as brightly as possible. 31. That’s what I consider true generosity. You give your all, and yet you feel as if it costs your nothing. 32. Feeling grateful to or appreciative of someone or something in your life actually attracts more of the things that you appreciate and value into your life. 33. The miracle of gratitude is that it shifts your perception to such an extent that it changes the world you see. 34. Most of us lead far more meaningful lives than we know. Often finding meaning is not about doing things differently; it is about seeing familiar things in new ways. 35. When you are grateful – when you can see what you have – you unlock blessings to flow in your life. 36. Gratitude for the abundance you have received is the best insurance that the abundance will continue. 37. A thankful heart is not only the greatest virtue, but the parent of all other virtues. 38. Express gratitude for the difficulties because they are our biggest teachers. 39. Gratitude is the worlds most beautiful language and the most genuine way for people to interact. Be grateful always, for everything and everyone, at every moment. Know your blessings, cherish them and sow more blessings. Having the ability to help others is a blessing. Whether the road is smooth or rough, always be grateful to the people who paved the way for us. If we always face all people and situations with a grateful heart, we will be happy and at peace every day. 40. My hope is that when people who are in pain see that I have a joyful life, they will think, If Nick – without arms and legs – is thankful, then I will be thankful for today, and I will do my best. 41. When I’m worried and I can’t sleep, I count my blessings instead of sheep. 42. When life gets sour … sweeten it with gratitude. Everyday may not be good, but there is always something good in everyday. Sometimes you don’t appreciate what you have because you’re too focused on what you want. Don’t wait to pray until you need something. Pray and be thankful everyday for your blessings! 43. Trade your expectations for appreciation and your whole world changes in an instant! 44. No matter what happens in your day, stay focused on gratitude. Even in the midst of a challenging time, I still feel thankful and blessed. 45. Choose to see the world through grateful eyes. It will never look the same way again. 46. Gratitude is the key to life’s abundance. 47. The thankful receiver bears a plentiful harvest. 48. Focus on what you have to be grateful for, not what’s missing. Focus on what you did achieve, not what you didn’t. 49. Look at everything as though you were seeing it for the first or the last time, then your time on earth will be filled with glory. 50. Jealousy is the result of counting others’ blessings instead of your own. 52. When I started counting my blessings, my whole life turned around. 53. Appreciation can change a day, even change a life. Your willingness to put it into words is all that is necessary. 54. If a fellow isn’t thankful for what he’s got, he isn’t likely to be thankful for what he’s going to get. 55. Make it a habit to tell people thank you. To express your appreciation, sincerely and without the expectation of anything in return. Truly appreciate those around you, and you’ll soon find many others around you. Truly appreciate life, and you’ll find that you have more of it. 56. 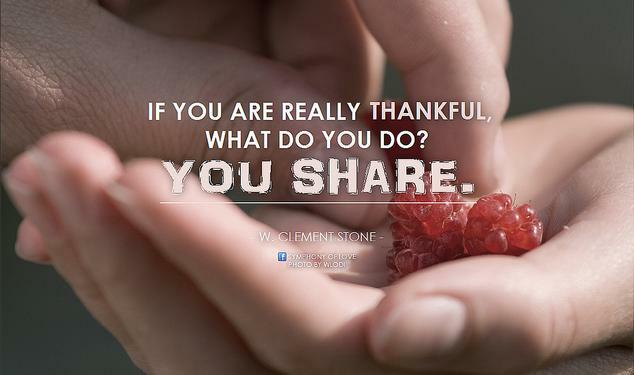 If you are really thankful, what do you do? You share. 57. Not what we say about our blessings, but how we use them, is the true measure of our thanksgiving. 58. Gratitude is what opens the spiritual doors to all the blessings. Everything becomes clear, you see, you feel, you live. 59. Seeds of discouragement cannot take root in a grateful heart. 60. When you look at life through the eyes of gratitude, the world becomes a magical and amazing place. 61. Sometimes you have to stop and be grateful for what you have even when you don’t have everything you want. 62. It is not happiness that makes us grateful, it is gratefulness that makes us happy. 63. Gratitude is the fairest blossom which springs from the soul. 64. Gratitude is a powerful antidote for the blues. You can be angry at life for not giving you all you want. Or you can feel blessed for all you have. 65. Wake up every morning with a thankful attitude. Expect something good to happen in your life today. Instead of complaining about what’s wrong, be grateful for what’s right. There’s a lot that is good in your life – don’t take it for granted. You can’t base your happiness on what you have or don’t have. Learn to be content in every situation. 66. There is a calmness to a life lived in gratitude, a quiet joy. 67. Gratitude, rather than complaint, opens the doors to life. 68. Your ability to see beauty and possibility is proportionate to the level at which you embrace gratitude. 69. If you want more from life – start by counting your blessings instead of counting your losses, deficits and wants. 70. The greatest source of happiness is the ability to be grateful at all times. Look back in forgiveness, forward in hope, compassion and up with gratitude. Of all the attitudes we can acquire, surely the attitude of gratitude is the most important and by far the most life changing. 71. Showing gratitude, is beautifying ourselves. 72. Gratitude is a mark of a noble soul and a refined character. We like to be around those who are grateful. They tend to brighten all around them. They make others feel better about themselves. 73. Life is fragile, appreciate it. Gratitude changes the way we look at the world. Happiness comes to those who appreciate what they already have. Remember: there is always something to be grateful for. Gratitude is the door opening to the abundance in life. Remember to thank the tree for the fruits we ate. New Year: Getting another chance to make things right, to give more, to love more, and to start embracing life. 74. Be grateful every day for the brief but magnificent opportunity that life provides. 75. If you see no reason for giving thanks, the fault lies only in yourself. 76. If we consciously remind ourselves of our blessings, it should become harder to take them for granted and adapt to them. 77. A sense of contentment is a key factor for attaining happiness. 78. Gratitude always comes into play; research shows that people are happier if they are grateful for the positive things in their lives, rather than worrying about what might be missing. 79. Gratitude is absolutely the way to bring more into your life. 80. When you arise in the morning, think of what a precious privilege it is to be alive – to breathe, to think, to enjoy, to love. 81. I am thankful to all those who said no. It’s because of them, I did it myself. 82. Gratitude unlocks the fullness of life. It turns what we have into enough, and more. It turns denial into acceptance, chaos to order, confusion to clarity. It can turn a meal into a feast, a house into a home, a stranger into a friend. Gratitude makes sense of our past, brings peace for today and creates a vision for tomorrow. 83. If all you did was just look for things to appreciate you would live a joyous, spectacular life. If there was nothing else that you ever came to understand other than just look for things to appreciate, it’s the only tool you would ever need to predominantly hook you up with who you really are. That’s all you’d need. 84. If we magnified blessings as much as we magnify disappointments, we would all be much happier. 85. When you drink water, think of its source. 86. The expression of gratitude is a powerful force that generates even more of what we have already received. 87. Gratitude implies humility — a recognition that we could not be who we are or where we are in life without the contributions of others. 88. The man who forgets to be grateful has fallen asleep in life. 89. An attitude of gratitude brings great things. 90. He is richest who is content with the least, for content is the wealth of nature. 91. Maybe if we spend just a little time saying “thank you” for what we do have, we won’t have time to dwell on what we lack. 92. Someone’s sitting in the shade today because someone planted a tree a long time ago. 93. We would worry less if we praised more. Thanksgiving is the enemy of discontent and dissatisfaction. 94. He who is not content with what he has, would not be content with whatever he acquires. 95. Life can be as glorious as we choose it to be. Gratitude changes everything. 96. Gratitude is a currency that we can mint for ourselves, and spend without fear of bankruptcy. 97. Embrace the people who have magnified your life at a time when you felt so small. Be grateful for the priceless gift they have given to you. Do not be discouraged by the distance you still have to travel. Instead, appreciate how many ‘life miles’ you have already covered. Your struggles have changed you into a stronger and better person. 98. If you want to turn your life around, try thankfulness. It will change your life mightily. 99. Never forget to express your gratitude for the abundance and beauty of your life. 100. I would maintain that thanks are the highest form of thought; and that gratitude is happiness doubled by wonder. 101. Enjoy the little things, for one day you may look back and realize they were the big things. 102. Reflect upon your present blessings, of which every man has plenty; not on your past misfortunes, of which all men have some. 103. It is impossible to feel grateful and depressed in the same moment. 104. I am thankful for my struggle because without it, I wouldn’t have stumbled upon my strength. 105. When you wake up in the morning, let your first thought be one of thanksgiving. 106. Be grateful you have a safe and secure place to sleep tonight. Some people don’t have that luxury. 107. Now is no time to think of what you do not have. Think of what you can do with what there is. 108. My expectations were reduced to zero when I was 21. Everything since then has been a bonus. 109. You may not like the life you have but right now someone is praying for the kind of life you are living. 111. When life is sweet, say thank you and celebrate. When life is bitter, say thank you and grow. 112. There is nothing that can have a more powerful effect on your mental health than the spirit of thankfulness. 113. When you start with nothing, you learn to appreciate everything. 114. I am grateful for the spices that sometimes surprise me in life. 115. Gratitude is a gracious acknowledgment of all that sustains us, a bow to our blessings, great and small, an appreciation of the moments of good fortune that sustain our life every day. We have so much to be grateful for. Gratitude does not envy or compare. Gratitude is not dependent on what you have. It depends on your heart. 116. I’m not grateful for this or that, I’m grateful. 117. Even our most difficult moments bring us gifts. The trick, of course, is gratitude. Therein will you find both your peace and your joy. 119. Have no mean hours, but be grateful for every hour, and accept what it brings. 121. Take life day by day, and be grateful for the little things. Don’t get stressed over what you can’t control. 122. Be thankful for the wrong relationships. They teach you, change you, strengthen you and prepare you for the right one.